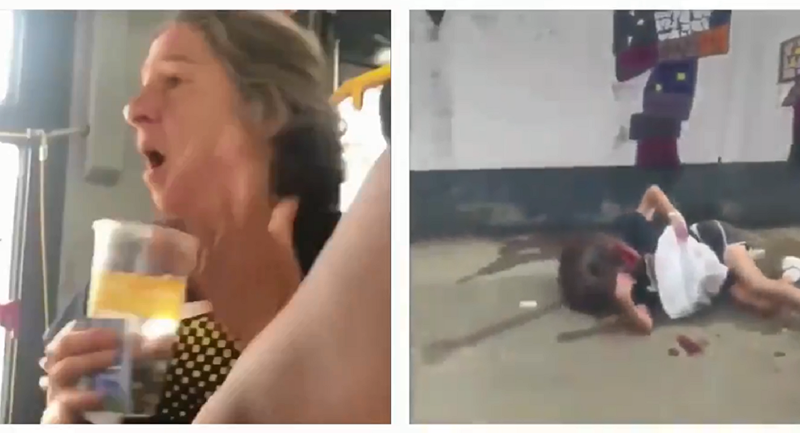 A woman who used the n-word on a crowded Washington, DC, bus during the evening rush hour was left bloodied on the sidewalk afterwards and taken to the hospital with lacerations on her face and head. Video shows the woman complaining about somebody playing music on the bus — fair enough. But as she makes her way out of the vehicle, she calls the riders the n-word. The video cuts there, then begins with another clip: the woman on the ground, her face covered in blood as the bus pulls away. The following day, blood still stained the sidewalk, as Fox reporter Anjali Hemphill showed in a picture she tweeted some 12 hours after the incident. The video, which was posted on Wednesday night at around 10 p.m., quickly shot up to more than 150,000 views. The Twitterverse had little sympathy for the woman, though some were impressed by the bravado of her racist remark. Locals noted that the bus line she was on, the X2, is pretty hot at a base level. It also travels through gentrified portions of DC into black communities, and many of the of the commuters are African American. Some of the following tweets contain graphic language. The woman is expected to survive, reports the local Fox affiliate. Police say they stopped two suspects nearby and identified them, but arrested neither, adding that they are continuing to investigate the beatdown.